Sally, thank you so much for the amazing feedback! We are so happy to know that you are pleased and hope to see you again soon! Thank you for the great review, Tonya! We're thrilled you're pleased with our service and hope to see you again soon! Stephanie, we are always excited to receive such an amazing review! Great customer service is always something our associates strive for and we are happy to have such great feedback! Stacie, we are always excited to receive such an amazing review! Great customer service is always something our associates strive for and we are happy to have such great feedback! Great food and even better service! Thanks for the wonderful review, Tim! Our team works hard to provide the best experience for all of our guests!! We are so happy that your dog is pleased with the food - and we hope to see you again soon! Tom, thank you so much for your positive review! Our staff attends 40-50 hours worth of training on both products and customer service throughout the year to learn how to best serve our customers! It is always a pleasure to have such wonderful feedback! Everyone is so helpful and makes you feel welcome in their store. Thanks for the wonderful review, Bridget! Our team works hard to provide the best experience for all of our guests!! We are so happy that you were pleased with your visit - and we hope to see you again soon! Robin, thank you so much for this marvelous review! Our staff seeks to provide the finest level of service achievable while offering our customers the best prices possible! We hope to see you again soon! Excellent customer service! They are so helpful to carry the dog food to my car for me. Thank you so much for the great review, Kenny! Our team strives to go above and beyond for every customer! We hope to see you again soon! Great customer service. Knowledge people on products. Helped us pick a food for our dog and frozen goats milk for probiotics. Our dog is a different dog now that his digestive system is happy. Thanks so much!!!!! Bart, thank you so much for such an outstanding review! Our team strives to go above and beyond to provide a wide variety of quality products for each pet's specific needs and ensure an excellent experience for each customer! We're thrilled you're pleased with our service and hope to see you again soon! What a wonderful store! Kim provided excellent customer service by answering our questions and concerns. She directed us to the product our lab needed. Sallie, our lab, loves your orthopedic bed and feels better after starting Prudence ultimate hip and joint chews. Thank you! Cindy, thank you so much for such an outstanding review! Our team strives to go above and beyond to provide a wide variety of quality products for each pet's specific needs and ensure an excellent experience for each customer! We're thrilled you're pleased with our service and hope to see you again soon! Bought some stuff for my dog on amazon and it never came. Thought I’d try out Hollywood Feed and it was amazing. They had what I needed, they were helpful, and helped me move stuff around in my car. They also carried a large box with a kennel to the car for me. Great service! Thanks for the wonderful review, Lindsay! Our team works hard to provide the best experience for all of our guests!! We are so happy that you were pleased with your visit - and we hope to see you again soon! I always find what I want and the staff is great-friendly and helpful. Susan, thank you so much for such an outstanding review! Our team strives to go above and beyond to provide a wide variety of quality products for each pet's specific needs and ensure an excellent experience for each customer! We're thrilled you're pleased with our service and hope to see you again soon! Great customer service! Always attentive and remembers our names and dogs names. We love Hollywood feed! Thank you so much for the stellar review, Tamara! Our team strives to go above and beyond for every customer- especially the four-legged ones! We hope to see you again soon! Thank you for the fantastic review, Marsha! Our team strives to provide a wide variety of quality products to suit each pet's specific needs! We hope to see you again soon! Thank you so much for the great review, Virginia! We're thrilled you're pleased with our service and hope to see you again soon! Thank you so much for the amazing review, Brenda! Our team strives to go above and beyond for every customer! We hope to see you again soon! What great service! The staff is very helpful and knowledgeable. I felt like a friend, not just a customer. 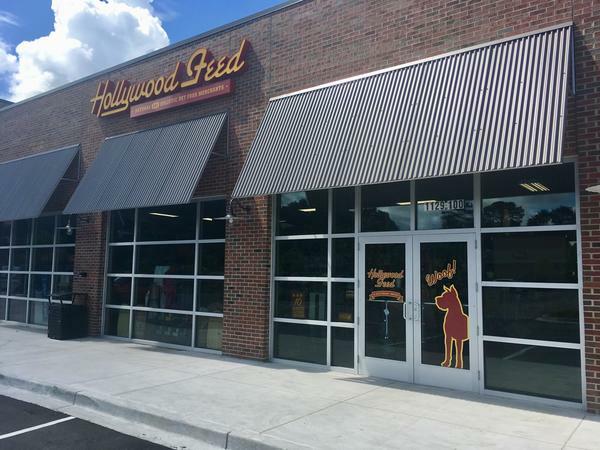 I would recommend Hollywood Feed for all of your pet needs. Jim, thank you so much for the excellent feedback! Often, our customers and their furry friends become like our family. We're thrilled to hear you are pleased!! We love Hollywood Feed!! Excellent service every time we come in. Freckles... our German Shorthaired Pointer absolutely loves the attention he receives upon his arrival!! We appreciate the time that is taken to answer our questions, the recommendations given from a very knowledgeable crew, and the friendliness that is genuine from the employees!! That means a lot in a busy world that seems to have forgotten how much customer service means to someone! Thanks for the phenomenal efforts and service guys... You Rock!! Thank you so much for the incredible feedback! Our team attends monthly training on pet products and nutrition so we are able to better serve our customers and their furry friends. We strive to always go above and beyond for our guests, and we are truly pleased to hear how happy you are with our service. Thank you for the 5-stars and we'll be looking forward to seeing you and Freckles again soon!